Don't worry, that's "modelling Arecibo", not "modelling at Arecibo." This doesn't involve me posing in skimpy clothing in strange positions with the telescope in the background. That can be arranged, but my fee is very, very high. It does involve me in one or two weird positions and getting hot and sweaty, but for entirely legitimate reasons. Anyway, it was bound to happen sooner or later. I can't very well work at one of the world's largest and most - dare I say it - iconic telescopes and not try to model it at some point, or I'd feel silly. 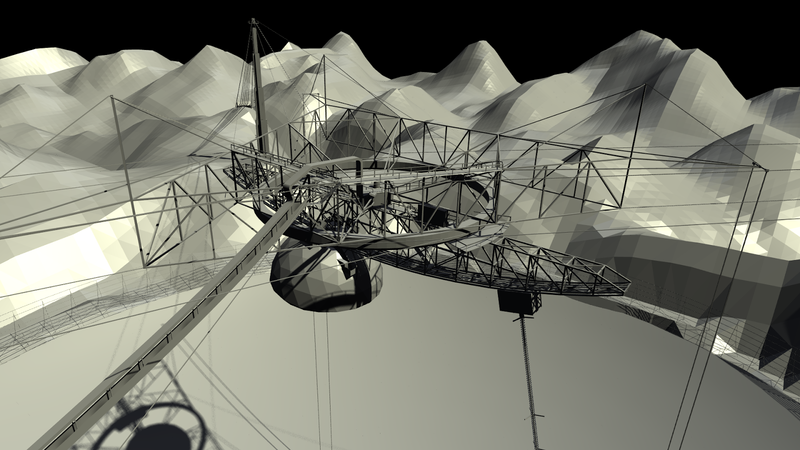 Actually, I always had a long-term goal of modelling the entire site and making it into a Half-Life 2 level. It would make for a seriously perfect setting. It's got the massively complex industrial setting of the platform (with its perilous 140m drop), a road running by steep cliffs and dense jungle, and the whole complex is fenced off, making it a natural stand-alone level. It's also got a couple of small office buildings with very narrow corridors that could become incredibly creepy at night. But best of all is the area underneath the dish, which is replete with small concrete towers (just large enough to hide behind), small wooden shacks, rusty old antennas and a large ditch that's half-full of water. The place practically screams FPS level. 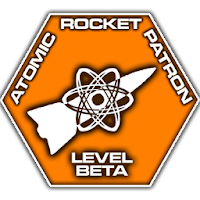 Seriously, if anyone is au fait with making HL2 levels, do let me know. But I digress. Right now there's a very specific goal (because my boss told me to) of modelling the telescope (not the accompanying buildings) and getting it laser-etched in glass. Established readers will recall that I had my thesis data etched in glass - this is very similar, except that while no-one else will want a huge chunk of glass full of blobs, they might very well be prepared to pay for a small chunk with a cute little model of the telescope inside. We'll see. 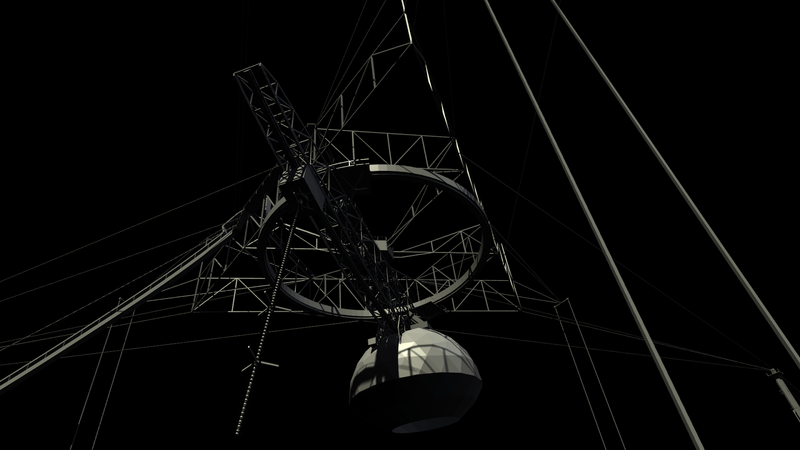 Modelling the whole site would be a formidable challenge, but even modelling just the telescope is tricky. The basic design is easy. The detail is ferociously complex. 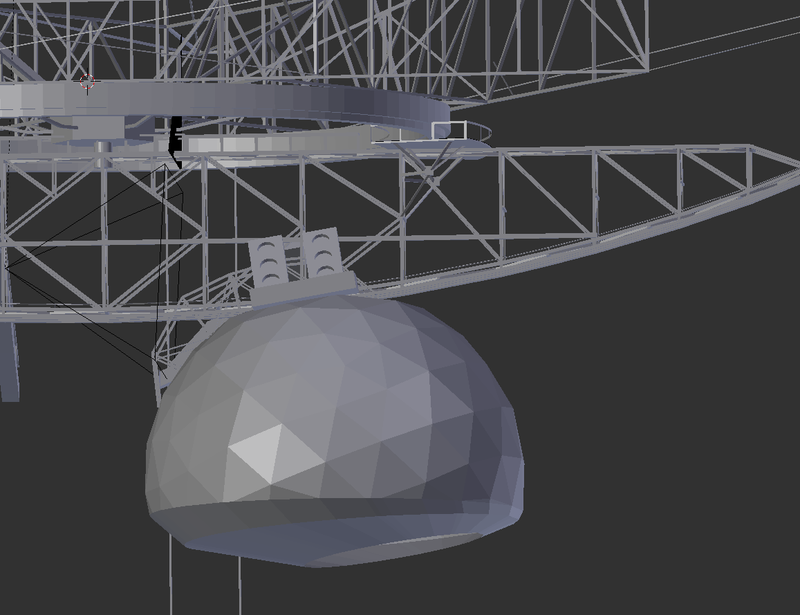 Modelling even the basic structural layout of this is nearly impossible without extremely detailed data or, better yet, schematics. Fortunately I was lucky enough to be given some by my other boss. I probably shouldn't post these, but they're hugely detailed. It seems as though almost every joint is rendered from multiple angles. But once I had them, tracing the general structure became a lot easier. These are not the official schematics, they're what I ended up with. The real ones are much more detailed. They also contain mistakes. 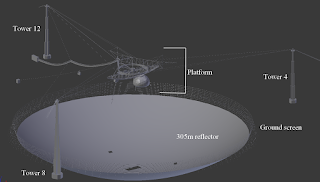 By far the biggest is the reflector itself, which has been drawn assuming it was around 850ft across, because the artist assumed the 1000ft diameter was along the curvature of the dish, and not rim to rim as it is in reality (and yes, everything is measured in feet). Since the dish is spherical (unlike most telescopes it's not a parabola) this was easy to correct. Other mistakes (probably not actually mistakes at all - the schematics appeared to date from the mid 90's, and things change) were more subtle. For instance, in one drawing the azimuth arm was shown as being slightly asymmetrical, with one end tapered and the other truncated. I checked some photos to see if this was the case, but quickly realised it was better to just go outside and have a look. This was true for a lot of other details. The arrangement of cables was something I was particularly keen to get right. Trying to figure out exactly how the 18 support cables attach to the platform in 3 dimensions was nearly impossible from the schematics, so I went for a walk (actually several walks). 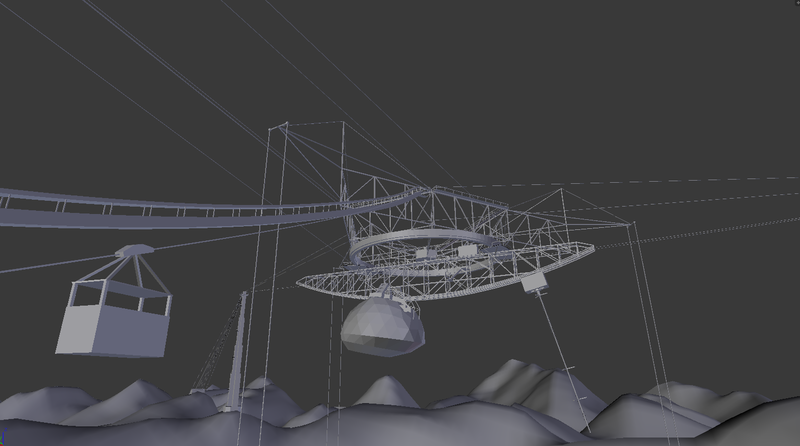 The cables are attached to the three towers, with cables from each tower attaching to different parts of the triangle. So by far the easiest way to see where the cables go is to go and visit the towers. little schematics of my own. Getting to the towers is not so easy. There's one at the visitor center, which involves a short but steep walk. To get to the others, you first have to go back down, then down the very steep walk to the dish, then up again another short but steep walk which is partly shady but also sheltered from the wind. Since the temperature is around 33C and the humidity 900,0000,000%, this is not so pleasant. Getting to the final tower involved crawling underneath a gate (I could have gone and got a key to open it, but meh). My way back was blocked by an impassable gate, so I went back the way I came and completed the 1km circuit of the dish, then back up the very steep hill and finally into my office. This explains my boss' puzzled look when he found me sitting in my air-conditioned office drowning in my own sweat. 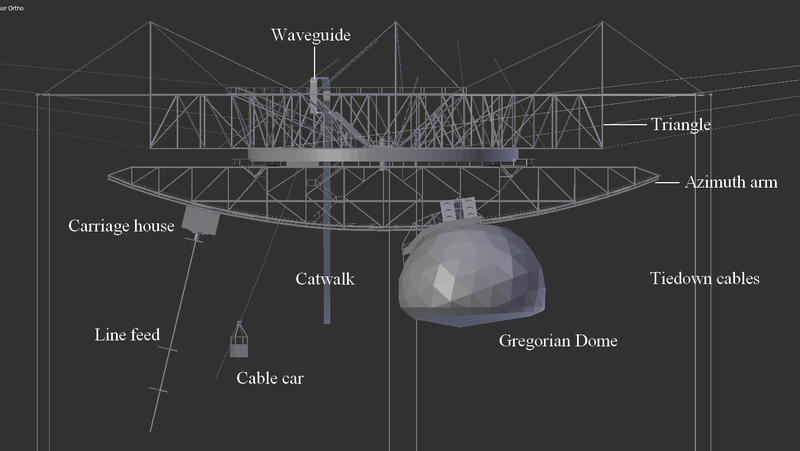 Some other details I got entirely from reference photographs because they're not on the schematics - the waveguide (which is about the size of an air vent and carries the signals from the telescope), the platform walkways, the fans on the side of the Gregorian dome... that kind of thing. These I had to do by guesswork, but the end result is at least a lot better than if they weren't included at all. Surly-looking astronomers also aren't included on the schematics. Then there's the terrain. This is intrinsic to the telescope; the natural sinkhole is one of the reasons it was built in Arecibo. It also means that one of the towers is a different height to the others, so getting it right is important. Fortunately the USGS provides Digital Elevation Model data for the entire US, though only at 30m resolution for Puerto Rico. I converted this into a Blender-readable format by using 3DEM to convert it into a Terragen terrain and then Terragen to export it as a Lightwave object, which Blender can read. Convoluted, but also tried-and-tested. 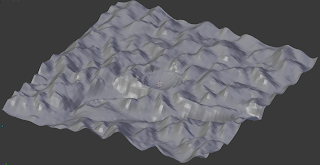 The 30m resolution is a real handicap though, and there was a lot of manual tweaking - the terrain in the immediate vicinity of the dish is largely fictitious. Around the edge of the dish is the ground screen. The dish is fixed, but the instruments can be moved as much as 20 degrees from overhead by moving the receivers along the azimuth arm. At high angles, they start receiving signal from above the edge of the dish. The ground screen limits the damage this would do. That wasn't in the schematics, so I went for more walks and asked other staff members how tall it is and what angle it's at. I also simplified its structure somewhat so that hopefully it will be easily visible when etched in glass. The support structures for the ground screen vary depending on how close it is to the cliff. Here, where the cliff is very close, the metal girders go into the cliff. In other places they're not quite so close, and join on to vertical concrete pillars. In a few places the cliff is very far way and they form tripod structures. Unfortunately the 30m terrain resolution is just nowhere near enough to attempt modelling this accurately, so I simplified everything and only modelled the tripod variant. The business end of the telescope is the platform. 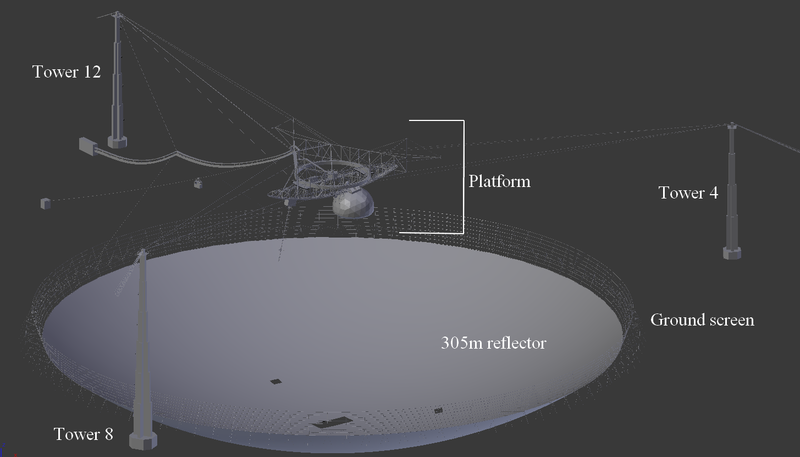 Sure, the 305m reflector is great, but it's the 900 tonne structure hanging in the air that houses the instruments that actually collect the signal. In Goldeneye, Sean Beam famously falls off the 30m-long line feed before the whole thing explodes. 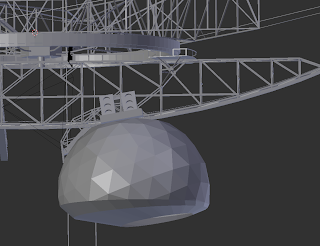 Because the reflector is spherical, radio waves get focused to a line, not a point, so a line feed is a clever way to receive the signal (and yes, I did include the correct number of circular rings in the model, even though they'll never show up in glass). An even cleverer way is to use two more reflectors to focus the waves to a point, which is what's done inside the Gregorian dome. The dome itself looks a lot like an icosphere, but unfortunately, it's subtly different. As you can see, I never figured out what the shape really is. And that's about it for now. The model is with the etching company, but there's a bunch of stuff that could be done with this for education and outreach... even if my Half-Life 2 thing doesn't pan out. The telescope is a nice size - quite a bit bigger than the Colosseum and a heck of a lot bigger than any other (filled aperture) radio telescope. Size comparisons become a lot easier with a 3D model than trying to Photoshop everything, and are always a good way to impress people. A) Ask them politely to stop. B) Explain to them that we could detect their phone even if it was on Mars, so they're ruining someone's observations. C) Tell them they're just a complete jerk. D) Punch them in the face. ... or something like that. It may require a teensy-weensy bit of work to become the next Skyrim. Anyway, there's definitely tonnes of stuff to be done with this. Watch this space. In a stunning breakthrough, scientists have announced today that the Loch Ness Monster has been found. Astonishingly, this revelation came not from Scottish biologists, but from a Puerto Rican astronomy student. I don't often talk about cutting-edge research, but this time I can't resist making an exception. My summer student is currently experiencing the joys of trawling through data cubes looking for the hydrogen gas which fills many galaxies. He found this one just a few days ago. And bugger me (no, not literally) if it doesn't look quite a lot like a famous Scottish lake monster. The galaxy image shown above is the optical counterpart of the hydrogen he detected, and comes from the Sloan Digital Sky Survey (the plesiosaur is some random painting from the internet since there isn't a corresponding Digital Plesiosaur Sea Survey) . Here's the galaxy without a visit from Nessie. I did no image processing on this whatsoever - this is exactly the image taken straight from the survey data. sure seems like Nessie to me. 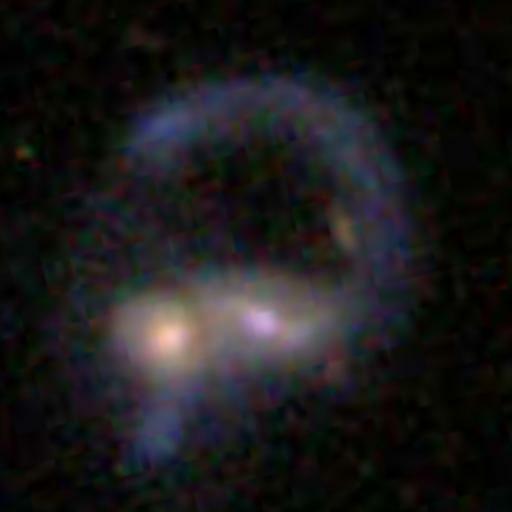 Galaxies do not normally look like this, of course. This is pretty dang weird. Not nearly as weird as Hanny's Voorwerp, but definitely very unusual. To try and figure out what was going on, I contacted my theoretician friend (who we last met destroying galaxies) to see what he could come up with. His considered professional opinion was that the galaxy looks more like a scorpion. Maybe he's right. I wasn't going to argue - he'd just destroyed an entire galaxy, after all. I normally avoid posting such contemporary research here for several reasons. Firstly because I never really wanted this to become a science blog at all, but that's what happened (anyway there aren't enough science blogs insulting the Queen and photographing potatoes in my opinion, so maybe that's not such a bad thing). But more importantly - new results should never be trusted. Science is slow, and above all, full of doubt. Mistakes are made and all too often results which seem exciting one day can seem pretty humdrum after a month of painstaking data analysis finds a critical flaw. Or, to quote Terry Pratchett : "It wouldn't be research if you knew what you were doing." About 700 million light years distant. Nessie measures about 200,000 light years across (roughly twice the size of the Milky Way). Contains around 10 billion times the mass of the Sun in hydrogen gas (this is quite a lot as galaxies go, but not really extreme). So why does Space Nessie look so different to other galaxies ? Well, the honest truth is we just don't know what's going on here. It's probably the result of two or more galaxies colliding and merging, which is known to be able to produce really weird shapes. Maybe the "head" of Nessie is a smaller dwarf galaxy which is being ripped apart by a larger one, leaving behind a trail of stars to form the "neck". Maybe. It's going to take a lot of work to figure out exactly what's happening. Which is fun. UPDATE : For those who like these things, this was reshared by Discovery News, CSIRO, The Sun (yes, right above the page 3 girls, pretty much) and... Fox News. Urrgh. In the last three posts I've destroyed a galaxy, photographed a potato and turned an asteroid into 300,000 cruise ships. Well, gosh darn it, this time I'm going to write a proper blog post, without any CGI at all... not much, anyway. Julia appears to have been morbidly addicted to the telescope, having visited as an undergraduate, a graduate student for the single-dish summer school and as a pre-doctoral fellow for a whole year, then came back as a postdoc under Cornell and stayed on after the management change. Having climbed every single rung on the AO career ladder short of management, she's running away to sea. By which I mean the Naval Research Laboratory, which I choose to believe is a giant floating telescope that's bristling with cannons. Common Observatory practice appears to be to bestow departees with a large picture of themselves, standing in front of the telescope, signed by all the staff. I don't know why anyone would want such a thing, but Julia didn't get one of these. This is possibly for the best as she insists on closing her eyes every time she has her picture taken. Instead, Julia will eventually get a glass cube with a little model of the telescope laser-etched inside. Julia leaves behind an unfortunately transient legacy of cats. These cats, except for one. Apparently they have "run amok" and must be removed. Julia has also promised to take a cat, haven't you Julia ? Fortunately the total of 5 cats are being steadily relocated. Three are still up for grabs. Want one ? Seriously, come along and take one - you catch it, you keep it. Actually, we'll catch them for you. And vaccinate and sterilize them too*. 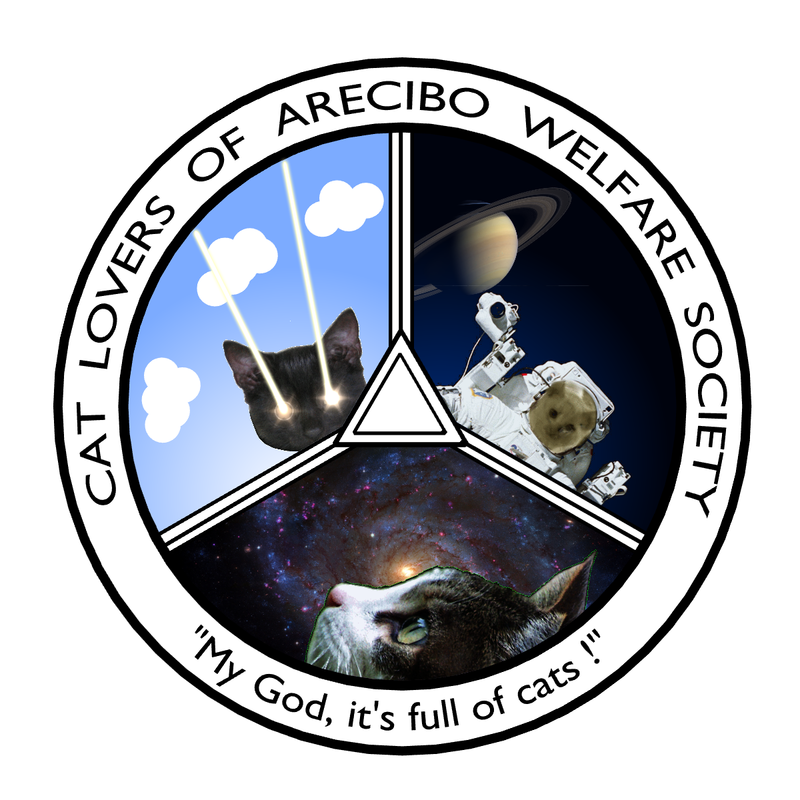 Take a cat and I personally will give you a tour of the telescope, probably. Heck, I'll even shower you with official CLAWS merchandise of your choice. Hats, mugs, stickers, badges, T-shirts... we haven't got any of them, but we'll order them specially. * By which I mean take them to the vet. No-one here has the requisite scissor skills to properly snip that which must be snipped. ... and suspect young ladies holding large feathery spears for some reason. 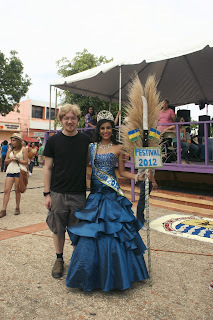 This was the sugar cane festival of Hatillo. It also featured some truly outstanding (not in a good way) karaoke but not much moonshine, which is surprising given that sugar cane is the main ingredient. Finally, in totally unrelated news, my first media interview appears in this month's Ciel et Espace. French readers should go at once to the nearest newsagent and buy a copy. 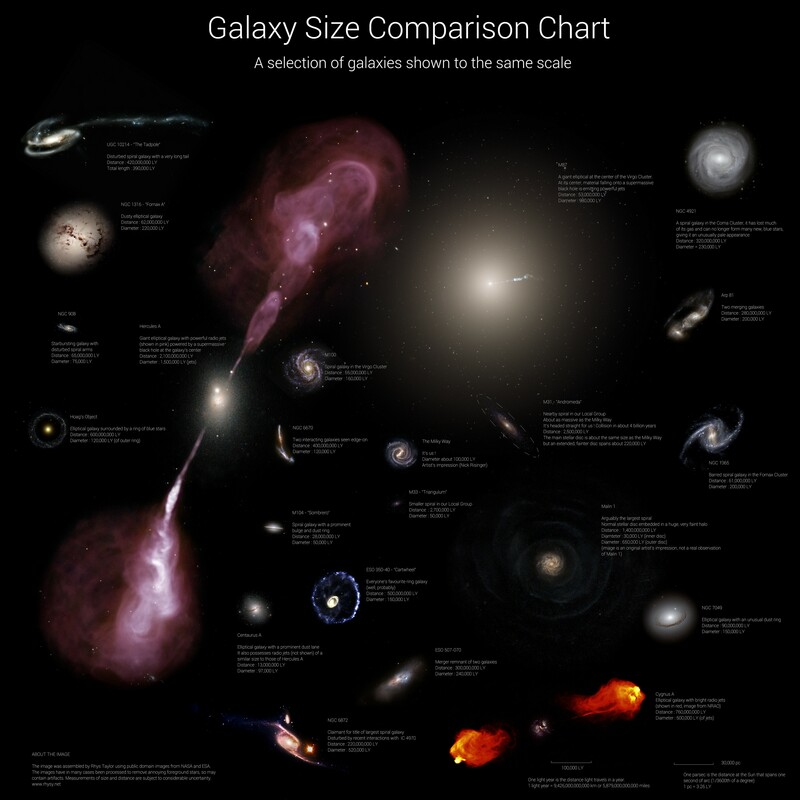 You'll find not only the galaxy size comparison charts in handy printed form, but also a 1 page interview in which I jabber on about the importance of outreach and Star Trek. Mexican readers won't have to wait long either - a special space edition of Conozca Más comes out... well, about now, actually.